Once, Still & Forever. Photographs by Jessica Backhaus. Published by Kehrer Verlag, 2012. Kehrer Verlag, Heidelberg, 2013. Hardbound. 88 pp., 55 color illustrations, 9-1/2x11-1/2". 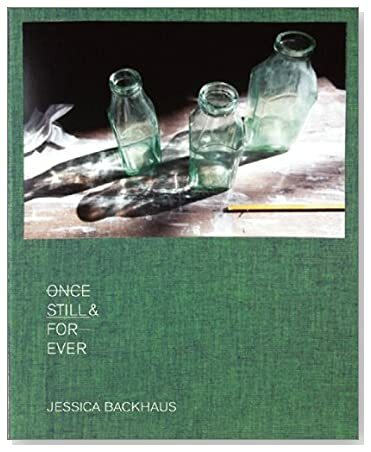 Jessica Backhaus’ latest monograph Once, Still & Forever is a painterly reflection on time, place, and emotion. Those familiar with Backhaus’ earlier titles Jesus and the Cherries, What Still Remains, One Day in November, or I Wanted to See the World know of her inquiring eye, and will be charmed by her continued exploration of the world’s most delicate fragments. Once, Still and Forever, by Jessica Backhaus. Published by Kehrer Verlag, 2013. A window painted with plants, a reel of weathered twine. The rain soaked rails of a train lead us further. Strange and familiar fruits. Glass bottles, vessels of the past. Refractions, reflections—spaces of silence and of sound, artifacts of darkness and golden light. What is vast becomes small, and what is small becomes vast. Backhaus paints with the layers of the world, finding strokes of beauty in the otherwise mundane. She reminds us of the power of looking and the importance of affection, present in every frame. She reminds us, ultimately, of our own existence. SHANE LAVALETTE (b. 1987, Burlington, VT) is a photographer currently living and working in Somerville, MA. In 2009, he received his BFA from Tufts University in partnership with The School of the Museum of Fine Arts, Boston. His photographs have been published and exhibited internationally. In addition, Lavalette is the founding editor of Lay Flat, a publication of contemporary photography and writing on the medium. www.shanelavalette.com www.layflat.org.